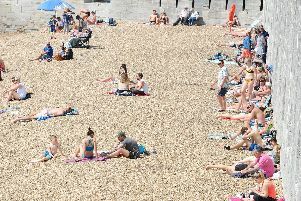 Portsmouth is set for ‘very high’ UV levels later this week, according to the latets forecast. The Met Office is predicting that the warm weather is set to continue in the city over the coming days with highs of 21 degrees expected by Monday. However while the sunshine can mean BBQs and trips to the beaches, it can also bring with it some downsides - like ‘very high’ pollen levels continuing to bring misery to hay fever sufferers. UV levels are measured on an index from one to eleven and the Met Office is forecasting that Portsmouth will experience UV levels of eight (very high) on Thursday and Friday. UV levels indentify the strength of ultraviolet (UV) radiation from the sun at a particular place on a particular day, allowing you to take the necessary precautions to help reduce the impact of UV on your health. Small amounts of UV exposure can be beneficial as it is essential in the production of vitamin D, however over exposure of UV can lead to serious health issues, such as skin damage and skin cancer. The current forecast for Portsmouth is for mainly dry and occasionally sunny weather tomorrow and Thursday, with highs of 19 degrees on both days. On Friday it will be sunny with highs of 20 degrees, while over the weekend the Met Office is forecasting a return to cloudy weather with highs of 19 degrees on Saturday and Sunday. But things are looking up for Monday with sunshine and highs of 21 degrees being forecast.